Today we’re going to look at the ranking status, content, and SEO of personal injury lawyers in Spokane Washington. Not to downplay the complexity of it but this is a niche where I could absolutely work wonders. If SEO in Los Angeles is a 65 car pile up with multiple severe injuries, Spokane is a fender bender in a grocery store parking lot. This is excellent news, as getting the job done here will be significantly less costly than competing in LA where some personal injury lawyers spend over $60,000 a month on pay per click advertising alone. Additionally, results will come significantly faster, and ongoing content efforts will result in an even broader reach. Washington is one of the minority of 13 states that recognizes pure comparative fault. Under this system of comparative negligence, a party claiming damages might be able to recover them even if he or she was 99 percent at fault. Depending on what state you’re in, most states won’t permit a recovery if you’re 50 or 51% or greater at fault for an accident. Now this is sure to change. And keep in mind none of these attorneys are necessarily better than the other, it is just where they are currently ranking in a Google search query for “Spoke personal injury lawyer”. Note the local 3 pack is closely correlated with organic results. Swapp gets no local map result as he has no staffed location in Spokane. Maurer is running a WordPress site. This one has a blog on it with some content going up here and there. Layman is running WordPress as well. This site appears to consist of a dozen pages or so. Bruce Kaiser’s site is running a custom theme of sorts with a couple dozen pages and the same goes for Timothy Nodland’s website. 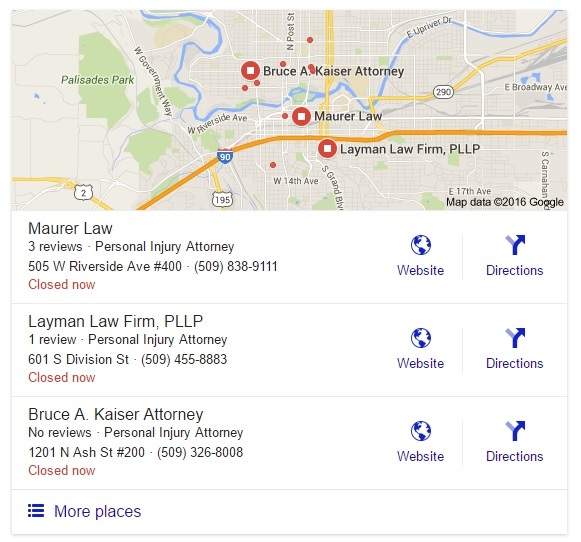 Google Local result for “Spokane Personal Injury Lawyer” as of May 13, 2016. 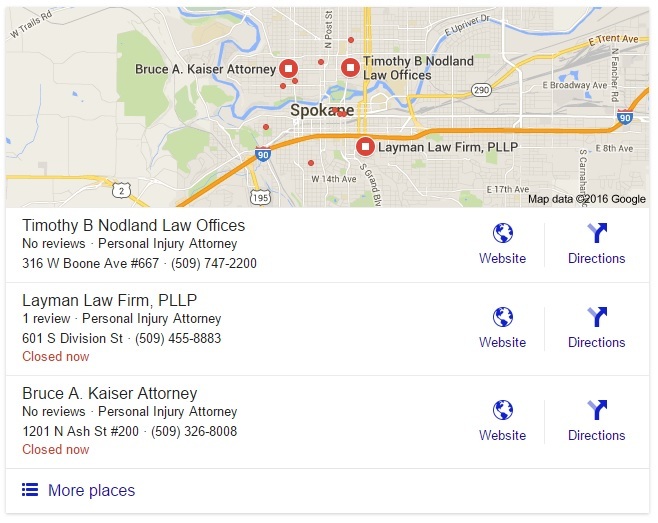 Google Local search results for “Spokane Car Accident Lawyer” as of May 13, 2016. I run into cities sometimes where there hasn’t been an all out SEO war and this is one of them. One of the attorneys (not saying who) actually ran press releases to get their links, which is unheard of in competitive niches and a manipulative SEO tactic frowned upon and even considered webspam on many occasions. Google devalued most of these links years ago. Very few of the attorneys above have blogs. In fact, only 1 or 2 of them do. They are REALLY missing out on important web traffic. I manage a personal injury site which has over 4,000 articles on it. Not everyone is typing things in to Google such as “car accident lawyer”, they are asking questions such as “What if I was a passenger injured in a car wreck?” or “What if I was partially responsible for the accident?”. Without this content, people just aren’t going to get to the sites. Web traffic estimates are extremely low. Semrush is giving me organic traffic estimates to most of the websites here in the 10 – 30 hits per month range. Wow. 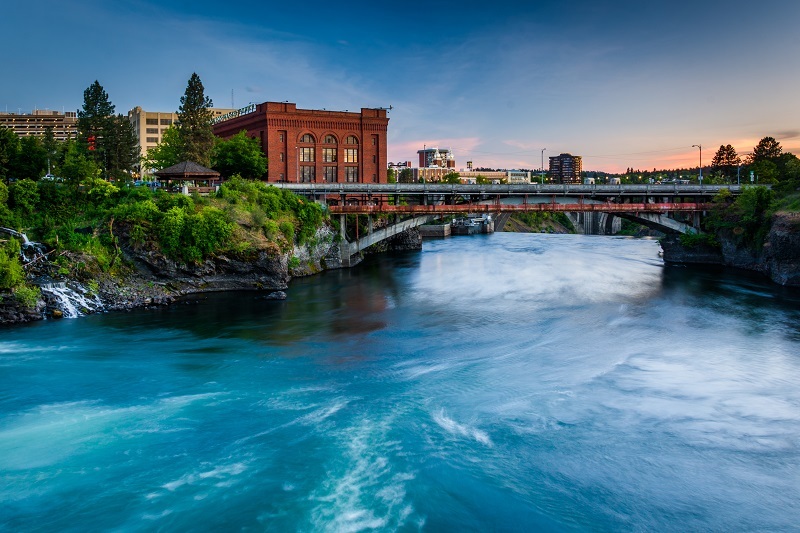 While Spokane isn’t as big as Portland or growing as fast as Seattle, showing up in search results when people are looking for you will absolutely result in cases. Many of the most highly rated attorneys are on page 2 and missing out on cases which may be going to a less experienced competitor or even to someone out of state. If you need assistance in this niche, contact me today for a free consultation. It is right up my alley as I specialize in helping personal injury lawyers with their content and SEO.